For children, the idea of miniature things is something innate. It’s the delight we experience at holding a tea set that fits into the palm of our hands, or seeing scale reproductions of a theatre or a house. For adults who build miniature houses, the process is an art; it incorporates many artistic disciplines and trades, including painting, sewing, interior design, silversmithing, and ceramics, to name just a few. For one man named Michael Paul Smith, the art became a way of remembering his childhood through creating an entire 50’s based community called Elgin Park. His work was spotted by a reporter in England and grew to be featured in news outlets like National Geographic, craftsmanshipmuseum.com, and the Daily Mail. This fascinating hobby has developed such a following that it even has its own galleries and museums dedicated to the history and quality of the representations that so many skilled artisans love to create perfect dollhouses. Below are a few to visit either online or in person. 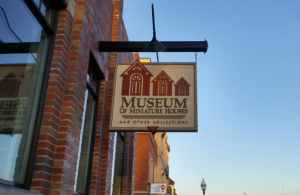 Built in 1981 in Indiana by a woman named Suzanne Landshof, along with two other co-founders, this museum has a staggering collection of over 600 miniature houses. A lifelong enthusiast, Suzanne speaks passionately about the craftsmanship that has gone into the collection and the donations they’ve received over the years. In the beginning, 95% of the museum’s funding was by loans. Today, the founders own over 85%, thanks to the visitors and lovers of miniatures. Open four days a week, the museum features displays of everything from historical events to medical advances, as well as, of course, the beloved dollhouses that so many children have enjoyed. The National Museum of American History has one of the largest dollhouses in the United States. With an impressive five stories, 23 rooms, and a scale of one inch to one foot, the dollhouse is a terrific achievement, built by Faith Bradford. The house contains furniture, linens, household items, and mini- toys. Located in Washington D.C., the museum is an American institution that has been running since 1964 and boasts over 3 million historical artefacts. 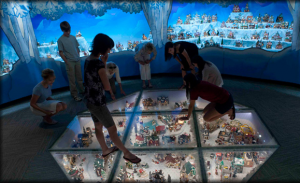 Located in Tucson, Arizona, this non-profit museum is not only dedicated to miniatures, but also displays history in an unusual way. The museum features exhibits of both antique and modern miniatures including original dollhouses as well as modern architectural models. The exhibits are based on historical events and eras gone by. Its founders, Patricia and Walter Arnell, developed a fondness for miniature houses in the 1930’s during which Patricia received dollhouses as a child. From her passion grew an organization that now has hosted over 64,000 visitors. The Rijksmuseum has been located in Amsterdam since 1808, and features three rather impressive historical dollhouses built in the 1700’s during which time dollhouses were actually seen as an adult hobby, much like they are today. The most famous collector of these affluent furnishings was Petronella Oortman. Two of the houses were built inside cabinets and the third was built to look like a house and contains a copious amount of handmade miniature silver. The rest of Rijksmuseum is dedicated to a remarkable collection of historical fine art in a variety of mediums including ceramics, works on paper, photography, fashion design, glass, and more.